Migrate infrastructure to K8s. Part 2. Basic services. 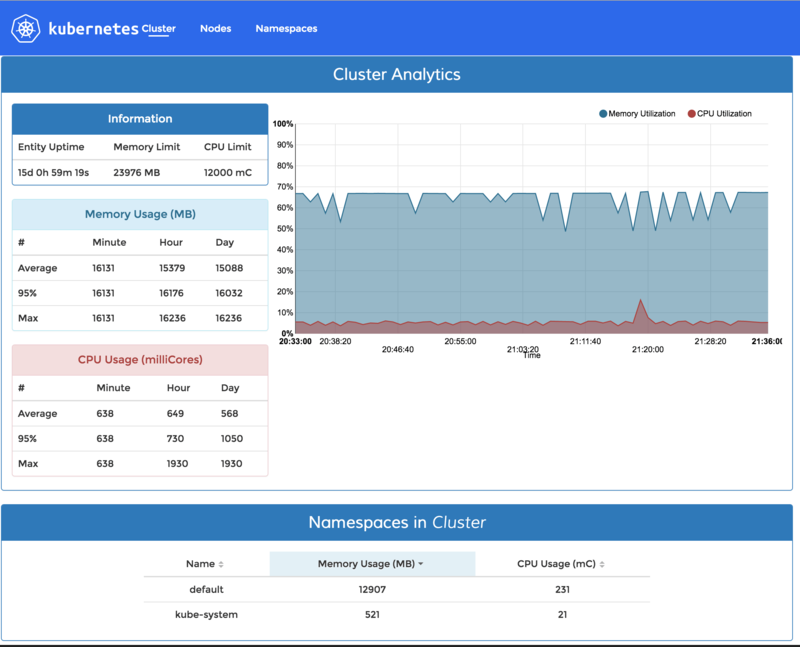 In this post I will go through installation of basic services to use and monitor cluster. For example DNS, heapster and different dashboards. Kubernetes comes with several very useful addons, available on its github, either in kubernetes or in contrib. But all these addons still needs to be installed. Before we begin with this, we need to do one preparation step - create system namespace. By default, Kubernetes has only one namespace, called default. But most of the addons available on the Internet requires you to have a separate namespace for system needs. It should be called kube-system. That’s it. Running kubectl get namespaces after this, should return two namespaces. This one is also part of the standard addons available in Kubernetes repository. To deploy it we need to know IP address of DNS and the name of the cluster we used during minions creating. If we’re using default IP address for DNS server (10.100.0.10) and default cluster name (cluster.local) we can just deploy it as is. Otherwise, we need to change skydns-rc.yaml to match our settings. Lets test that DNS is working. We can do this by runnning nslookup from some pod. First, we need to have a pod with nslookup available. Create the file called busybox.yaml and deploy it with kubectl create -f busybox.yaml. Now we want to have nice dashboards to monitor our cluster state and may be, even deploy new services from the web. For this, Kubernetes used to have two dashboards. But now it looks like that they replaced old one in addons. I have both installed, but the old one is kinda useless. So let’s take a look only at the new one, which is now the default. Deploy scripts could be found in k8s cluster/addons and also in dashboards own repository. To access it we need to run kubectl cluster-info to find out URLs. Heapster is one of the systems used in Kubernetes to collect metrics. Heapster uses grafana dashboard to show its metrics which will be installed as part of it. But it also has another dashboard - kubedash, which is pretty simple and nice for a quick overview of resource usage. 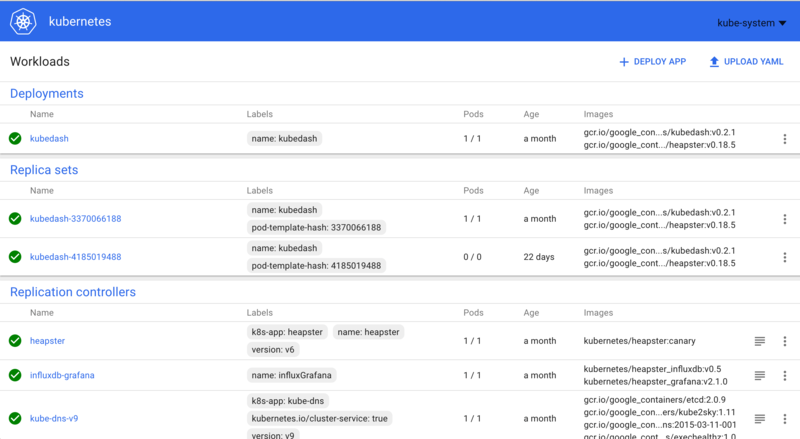 After deploy, kubedash will be available on https://<kubernetes-master>/api/v1/proxy/namespaces/kube-system/services/kubedash/. I’m using NewRelic service all the time to monitor my applications and servers. So I’m going to run it as a daemon on all minions. I’m running it also on masters, and it looks like I forgot to mention it in my previous post. So, here is my SystemD unit to run NewRelic container. NewRelic configuration I’m going to deploy, with great readme btw, could be found in kubernetes/examples/newrelic. Shortly, to run NewRelic in the pod we need to create a config file and then create a base64 hash of it, after this we can deploy it. To use config-to-secret.sh script from repository we need a Linux machine. That’s it for now. At this point, we have fully operational Kubernetes cluster with DNS and dashboards showing all our deployed containers and resource usage. Like this post? Want more? Subscribe to get updates delivered straight to your inbox.